Enjoy your favorite cruise drink concoctions with these party-durable magnificently-crafted collectible clear acrylic glasses that illuminate from the base with the push of a button. a Flashing Blinking Glow Multi-color rainbow light, as well as a choice of steady-on no-flash Blue, Green, Pink, Purple, Red, White, or Yellow lights. Lighted Glass has a motionless setting to view only one of the colors continuously, with each of 7 different colors above to choose from. Also features a Rainbow setting, which quickly cycles through each of the colors by gradually morphing, flashing and blinking. ***Pre-installed Batteries included, along with an ***EXTRA SET of 3-AG13 1.5v*** for more party time fun! 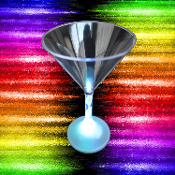 Approx 7-inch tall Light up LED martini glass with 7 different color settings, plus a rainbow morphing multi-color mode. Amazing effects in dim or low-light club conditions!. Shaken, not stirred. Flashing martini glass is amazing and guaranteed to bring your next party to life! Each 8 oz.classic-style standard-size martini glass is clear plastic. Individually boxed with pre-installed batteries, along with an extra set of batteries to keep the fun rolling! Use these flashy glasses to really add personality to your next holiday event or specialty house signature drink. Various light up modes ensure that everyone in the crowd will feel party-rific at your next event! *Requires 3-AG13 (LR44) batteries: Yes, batteries included, with *3-extras for replacing. Buy several for multiple discount & combined shipping!!! Three separate pieces easily screw together (battery operated BASE, lighted STEM, Drink Cup top), brilliantly designed to allow for easy hand-washing without chance of damaging the electronic lighting parts. -HAND-WASH only with warm soapy water. -Cup unscrews from lighted stem and base for easy washing. -Only the top cup can be immersed in water. DO NOT IMMERSE LIGHTED STEM OR BASE IN WATER! On/Off Mode-switch button on bottom of glass light base. See ''Multi-Color Light Up LED Martini Glasses'' or ''Flashing Martini Glass'' Youtube Video Demonstrations! FLASHING LIGHT CAN CAUSE SEIZURES IN PEOPLE WITH EPILEPSY. DO NOT USE IF YOU ARE AT RISK FOR EPILEPTIC SEIZURES.